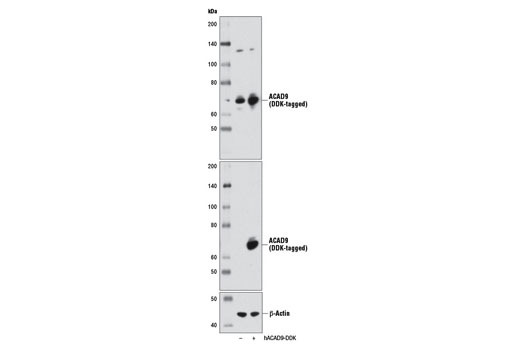 Western blot analysis of extracts from various cell lines using ACAD9 Antibody. Western blot analysis of extracts from 293 cells, mock transfected (-) or transfected with a construct expressing DDK-tagged full-length human ACAD9 (hACAD9-DDK; +), using ACAD9 Antibody (upper), DYKDDDDK Tag (9A3) Mouse mAb #8146 (middle), or β-Actin (D6A8) Rabbit mAb #8457 (lower). 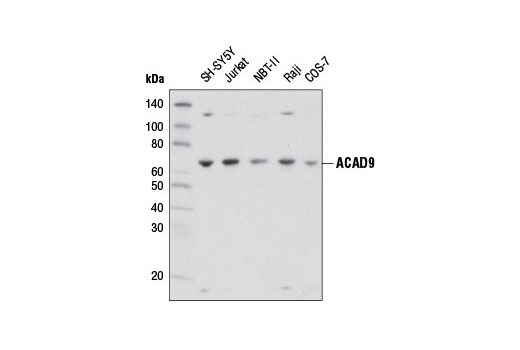 ACAD9 Antibody recognizes endogenous levels of total ACAD9 protein. Polyclonal antibodies are produced by immunizing animals with a synthetic peptide corresponding to residues surrounding Val512 of human ACAD9 protein. Antibodies are purified by protein A and peptide affinity chromatography. The mitochondrial flavoenzymes acyl-CoA dehydrogenases (ACADs) catalyze the α,β dehydrogenation of acyl-CoA esters (1). One of these enzymes, ACAD9, is essential for assembly of oxidative phosphorylation complex I (2). Studies have shown that ACAD9 gene mutations cause Complex I deficiency (2,3). He, M. et al. (2007) Am J Hum Genet 81, 87-103. Nouws, J. et al. (2010) Cell Metab 12, 283-94. Haack, T.B. et al. (2010) Nat Genet 42, 1131-4.